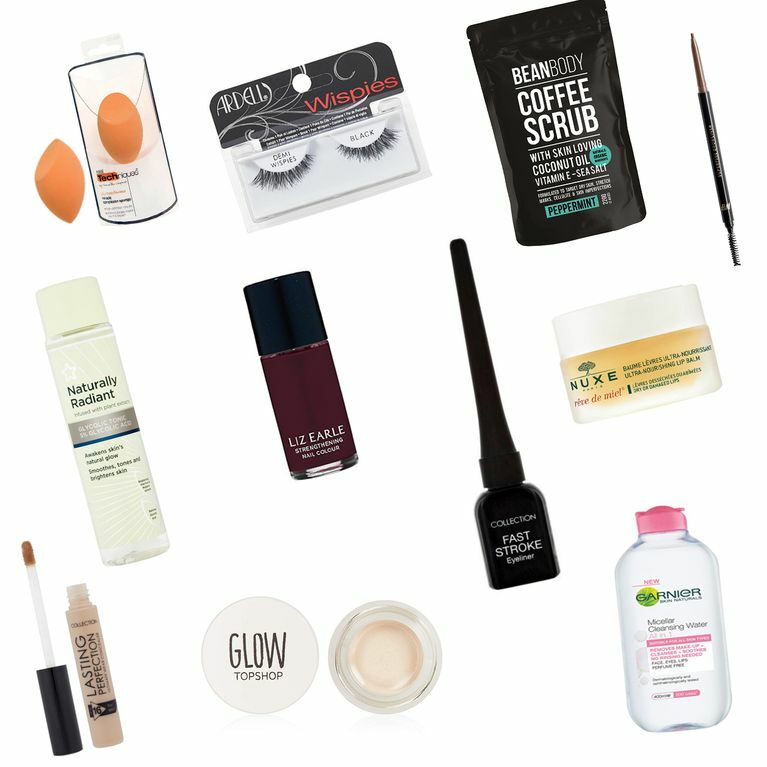 Budget beauty buys are hard to come by and budget beauty buys that actually work are an even rarer breed. With that in mind, we've rounded up our top pick of purse-friendly beauty products that are just as good to our bank balances as they are to our skin. So go ahead, check out the dupes that are giving all those cult classics a run for their money. Want a budge-proof eyeliner that you can apply with your eyes closed (literally)? This liquid fast-stroke Collection 2000 is just what it says on the tin and that's coming from a girl who's clumsier than Phoebe Buffay on a bicycle. When you find a good brow pencil, hold on to it for dear life and pray that bad boy never gets discontinued in your go-to shade. And, if said eyebrow pencil is also cheap , hold on it harder than you'd hold on your skirt on a windy day spent with Trump. A true cult product and all-round beauty trooper - the Nuxe honey balm will restore suppleness and relieve dry chapped lips, like a bag of frozen peas relieves a swollen cankle. Thanks to the natural honey and soothing plant oils, shea butter and grapefruit extract it's basically the equivalent of giving your smackers a good old mum hug. If a concealer offers enough coverage while simultaneously doubling up as an eyeshadow primer, then we consider that a soul mate match. Multi-tasking beauty is what we live for, after all. Enter the cult concealer by Collection 2000: the creamiest formula in all the land that's got every YouTuber talking. It will not leave you looking like a 6-day old Victoria Sponge. It will make you want to party that little bit harder because it's got more coverage than you can shake a selfie stick at. We're going to get real Celine Dion for a moment because this stuff makes us sentimental. Dear Micellar Water, "for all those times you stood by me" and "for all the joy you brought to my life" we want to say thank you. Thank you for being so gentle to our skin (that's coming from a girl with eyes as sensitive as the pink paws on a newborn pup) and for taking our makeup off effectively. Double cleansing has never been easier thanks to your sweet, glide-off-the-skin watery bod! A coffee scrub is like a good burger. We know it's dirty, we know we're going to make a mess but boy, is it worth it. See, it turns out caffeine isn't only good for making work days possible (read: turning us into fully functioning adults with a polite email etiquette), it's also good for reawakening your body - particularly your circulation. Be afraid cellulite, be very afraid. If your elbows, your knees and that difficult dry fold betwixt your ankle and your calf could speak, we think they'd say that this is exactly the cup of Joe it was after. Who'd have thought that an egg-shaped ball of foam would be the key to a beautifully blended base, eh? It's so simple and yet, also genius. How we survived our teenage years without them we'll never know but those lovely throwback orange foundation lines say it all. ​Designed to evenly blend makeup for a smooth application, the Miracle Complexion Sponge can be used all over the face. Using a light stippling motion, you can use the rounded sides of the sponge to blend the larger areas of your face while the precision tip is great for concealing pesky spots without overloading them with product. You can then use the flat part to reach the contours near your eyes and nose. Now show us your best dab! Tip: If you're a sucker for a dewy coverage, then try dampening the sponge a little before you apply your foundation. Then, on a clean sponge, blot a few drops of your favourite serum all over your face before you go in with your foundation. Your skin will look smoother than a fresh dry skippy. Bruno Mars fans, you know. Ever stepped out of a spin class and thought, damn I look glowy? Well, imagine that high-shine in a pot. Just with a little less sweat and a bit more dew. That 's what the Topshop Glow pot was destined to do - dot it on your cheekbones and along your brow for a gorgeously light but pigmented highlight. And all for just £10 - it's a magpie's dream. Of all the great things I could have inherited from my dad, I went for his wafer-thin lips and his even thinner eyelashes. It goes without saying then, that faux lashes with natural volume and lift are the Bonnie to my Clyde. Enter these cult classics from Ardell. They bring all the drama with none of the discomfort you can get from some of the heavier falsies on the market. They also happen to be very easy to apply, which means there's less chance of a pre-night out makeup tantrum. Winning. Wear them once and you'll understand the beauty blogger hype! This pasty underdog has long been a household name in the beauty world and for good reason. Ok, so it doesn't have the prettiest packaging but what it lacks in Instagram-worthy aesthetic, it makes up for in efficiency. We've been caking our hormonal chins in the good stuff for years and have yet to find something that cures redness quite it. I mean, name one other beauty product that can effectively soothe nappy rash, acne, eczema and all while looking as edible as a cream cheese. It's like fine dining for yo' face. Unless you've been living under a rock, the chances are you would have used or swooned over the renowned Pixi Glow Tonic. Well, this little fella is the more affordable cult classic our bank balances have all been looking for. Got money problems? Put some coconut oil on 'em. Boyfriend issues? Put some coconut oil on 'em. Got cracked feet? You guessed it, put some coconut oil on them bad boys because there's no problem too big for this all-purpose warrior. Tip: Hold an avocado-stone sized amount of coconut oil in your hand until it begins to liquefy, apply it to your feet concentrating on the heels and areas prone to hard skin, then slip straight into some bed socks for an hour. Bye bye trotters, hello baby-soft tootsies. Until you wear heels... then you'll need to repeat the process to save their soles. On this one at least, your mum's right. It's the product that everyone puts on a pedestal because fellas, it actually works and therefore deserves all the cult status. Since its creation in 1987, the specialist formulation has remained the same - well you know what they say, if it ain't broke don't fix it - which is why we're still buying it by the bucket load. A good ol’ vampy nail polish that’s as pigmented as it is nourishing. Yes to that! This fortifying, chip-resistant formula means you can make your mani last far longer all the while protecting your digits with skin-nourishing avocado and starflower oils. And if there's one way to make a millennial (and her nails) very, very happy, it's with avocado. Where they go, we follow. A moisturiser that's packed full of skin nourishing plant extracts and essential oils to hydrate our arid pores? Yes to that. It's rich, it's cheap and it sure does make your skin feel happier than Pharrell in a large hat. Made with organic sunflower seed oil and extracts of wild pansy, chamomile, calendula and rosemary extract, it's a great pick-me-up for tired, lack lustre skin. Well, what are you waiting for? Feed yo' face.